Plot: SPECTRE is back and plans to gain control of the Space Wolf Satellites. 007 must go undercover to uncover the new leader of one of his oldest adversaries. Highlights: Plane hijack; meeting with Blofeld. Above: British 1st edition Jonathan Cape hardback. 007 IS BACK AGAIN, on secret loan to the U.S. government in this brand-new, ultra-Bond thriller. His partner? None other than the tough-minded and gorgeous Cedar, daughter of his old friend Felix Leiter. His enemy? The legendary SPECTRE - the Special Executive for Counter-intelligence, Terrorism, Revenge and Extortion - a SPECTRE whose strength has grown in the new secret war waged in the gray corridors of political power. Bond and Cedar make a potent team, as they must, for they face an unending series of terrifying situations - from a skyjacking, to a plunging Washington, D.C., elevator, to armies of killer ants, to confrontation on a speeding monorail. Inexorably they work their way to the remote and ultra-luxurious ranch of the ambitious Texas tycoon Markus Bismaquer, where Bond comes face-to-face - and more - with Bismaquer's young French wife, Nena, and has experiences of a different kind with the tycoon's sinister, skull-faced partner, Walter Luxor. Political scandal and intrigue, military murder and mayhem, follow Bond, yet some final nagging questions continue to elude him until the last great revelation: who is SPECTRE's new leader, who calls himself Blofeld? And what is the final aim of SPECTRE's secret Heavenly Wolf operation? With Licence Renewed, John Gardner brought back James Bond, the world's most famous spy. 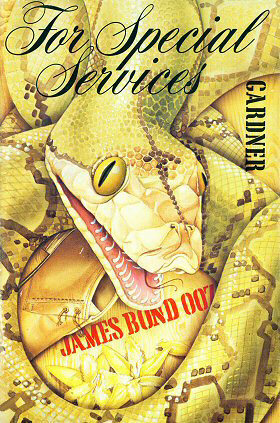 Now, in For Special Services, Bond is here to stay, in a super-thriller filled with suspense, intrigue, humour and sprawling action that has made Agent 007 a delight to millions of readers throughout the world. In For Special Services, Bond is on loan to the United States Government, his partner none other than the tough and beautiful Cedar, daughter of 007's old friend Felix Leiter. Their enemy? An old adversary, the legendary SPECTRE (Special Executive for Counterintelligence, Terrorism, Revenge and Extortion), has reappeared. Bond and Cedar find themselves in some deadly and terrifying situations - from skyjack to plunging elevator, from armies of killer ants in the Mid-West to horror on a private mono-rail - before they come face to face with the heir to Blofeld's iniquitous empire. Right: American 1st edition Coward, McCann & Geoghegan hardback. Far Right: American 1st edition Berkley paperback. Above Left: British 8th edition Coronet paperback (UK). Above Right: British 1st edition Coronet paperback. As with the first continuation James Bond novel, Licence Renewed, I must acknowledge grateful thanks to the literary copyright holders - Glidrose Productions - for inviting me to follow in Ian Fleming's footsteps, and attempt to bring Mr. Bond into the 1980;s. In particular, my personal thanks to Dennis Joss, Peter Janson-Smith, and John parkinson for their patience and trust. Great acknowledgment must also go to Peter Israel, of the Putnam Publishing Group, and my personal manager, Desmond Elliott, both of whom have given me valuable assistance and support. I would also like to express my personal gratitude to all members of Saab (GB) Ltd., and Saab-Scania in Sweden, for the amount of time, trouble, patience and enthusiasm they have put into proving that the James Bond Saab really does exist. In particular, i must mention - among a host of others - John Smerdo, Steve Andresia, Phil Hall, John Edwards, Ian Adcock, Peter Seltzer, and Hans Thornquist. When going through the acknowledgments for Licence Renewed, I realised I had omitted a most important name - the knowledgeable man who privately researched a short list of motorcars, which eventually led my putting Mr. Bond into a Saab: Tony Snare. Ian Fleming, being the great craftsman he was, always attempted - with some licence, granted to all writers of fiction - to get the nuts and bolts correct. I have tried to do the same thing, with one exception. While the NORAD Command Headquarters exists - in the Cheyenne Mountains, Colorado - I found it impossible to get any accurate description of the way into this incredible defence base. It has, therefore, been necessary for some invention here. All the space satellites mentioned do exist, and it is my understanding that the race for a Particle Beam Weapon is going on at this moment. The only exception, among the satellites, is the important one which I have designated the Space Wolf. however, I am firmly assured that the capability of these weapons does exist and that they are real, even though, at the time of writing, no country will admit to any being in orbit. In 1941 Fleming accompanied Admiral Godfrey to the United States for the purpose of establishing relations with the American secret service organisations. In new York Fleming met Sir William Stephenson, 'the quiet Canadian', who became a life-long friend. Stephenson allowed Fleming to take part in a clandestine operation against a Japanese cipher expert who had an office in Rockefeller Center. Fleming later embellished this story and used it in his first James Bond novel, Casino Royale (1953). Stephenson also introduced Fleming to General William Donovan, who had just been appointed Co-ordinator of Information, a post which eventually evolved into the chairmanship of the Office of Strategic Services and then of the Central Intelligence Agency. At Donovan's request Fleming wrote a lengthy memorandum describing the structure and functions of a secret service organisation. This memorandum later became part of the charter of the O.S.S. and, thus, of the C.I.A. In appreciation Donovan presented Fleming with a .38 Police Positive Colt revolver inscribed 'For Special Services'. "As the 747 came whining in, flaps fully extended and the spoilers lifting as the aeroplane rolled out, touching down gently on runway 28R, he pondered the hijacker's last words. No, he thought, it was too far-fetched, an obsession out of his past. Inspector. In... spector. Forget about the 'In'. Was it possible after all this time?" The villain schemes with a criminal syndicate to take control of a series of space satellites - a plot echoed in the 1995 movie "GoldenEye". M summons Bond to meet Felix Leiter’s voluptuous daughter, Cedar, who is a CIA agent involved in investigating millionaire Markus Bismaquer, who may have some connection with a revived SPECTRE operating under a relative of Blofeld. Posing as owners of a print which Bismaquer wants, Bond travels with Cedar to New York where they meet Bismaquer. Following several attempts on their lives, Bond races Walter Luxor for the prints in a dramatic Grand Prix, where Bond wins despite Luxor’s cheating. But meanwhile Cedar discovers (we never learn how) that their true identities have been discovered. Nevertheless, Bond meets Nena, Bismaquer’s single-breasted wife in secret and makes love to her before going to spy on her husband’s conference centre. 007 comes across a meeting of SPECTRE, who are planning to gain control of the USA’s military satellites. They will take over a base in Colorado by feeding the workers ice cream containing a chemical which makes them susceptible to orders. Bond is captured by SPECTRE and hypnotised into thinking he is General James Banker. Bond makes a surprise inspection of the NORAD base, in reality letting a SPECTRE agent in. However, Bismaquer is attracted to Bond and releases the hypnotism. He orders the troops to resist the SPECTRE men and during the battle Nena comes to rescue Bond and then kills Bismaquer, because it turns out she was Blofeld’s illegitimate daughter. She tries to escape, but is killed by her own pet snakes. Felix arrives to clear things up, and Bond heads on vacation with Cedar.